It is that time of year when we are thinking about putting the garden furniture away before the frost starst to settle in, but before you do, there is some tlc required to keep your garden furniture in tip top shape. At the start of summer you may have dragged out your old hardwood garden furniture that at one time looked stunning but now seems old and drab. Do not consider throwing away and replacing your garden furniture or putting up with an aged dull appearance because there are easy ways to breathe life back into the wood. With hardwood the furniture will have been treated and stained originally and most of these cause the wood to naturally change colour as they age anyway. You will find most hardwood garden furniture you buy starts out with a greenish hue that fades to a deep golden brown but over time that fades to a silvery grey colour. Now many people like the natural fade of the wood but if you feel it looks old and tired it is not that hard to give it a top up. Weather and sun can also have an impact on the state of your garden furniture so adding coats of wood stain will help revive it. If you really want to get rid of that greyish tinge a lick of wood paint is the way to go. Start by lightly sanding your garden furniture as this helps the new stain coat stick better and last longer. Gently wipe down the hardwood furniture with the white spirit to remove dirt and dust from the sanding process. Stir your wood stain well before use. Apply 3 even coats of stain, leaving 4 hours between each coat. Brush in the direction of the grain making sure to cover all the end grains. If you wish you can also add a layer of natural hued wood paint as well. Leave the furniture 48 hours before use. RN Williams Builder’s Merchants in North Wales have a great range of stunning garden furniture, decking, fence panels as well as garden accessories to keep your garden furniture in great condition. 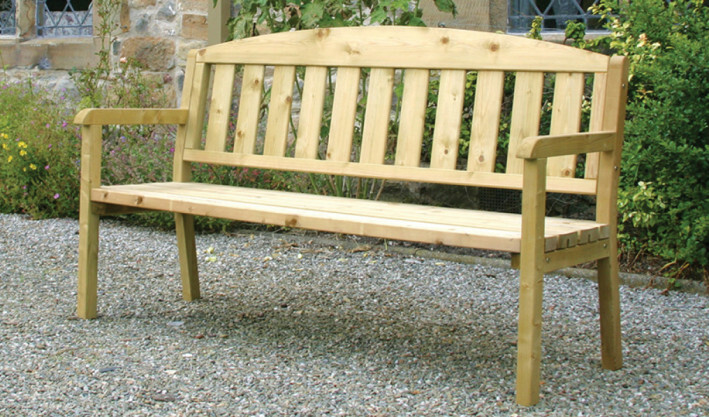 Learn how to breathe life back into your hardwood garden furniture. This entry was posted in Gardening, How To Guides by homeadmin. Bookmark the permalink.